My kitchen renovation is still new, shiny and wonderful to me. I’ve used blue accents in the kitchen and wanted to add a few fall accents. I could have just thrown a couple of pumpkins on the counter and called it decorated, but I wanted to add some mini pumpkins and I wanted blue pumpkins. 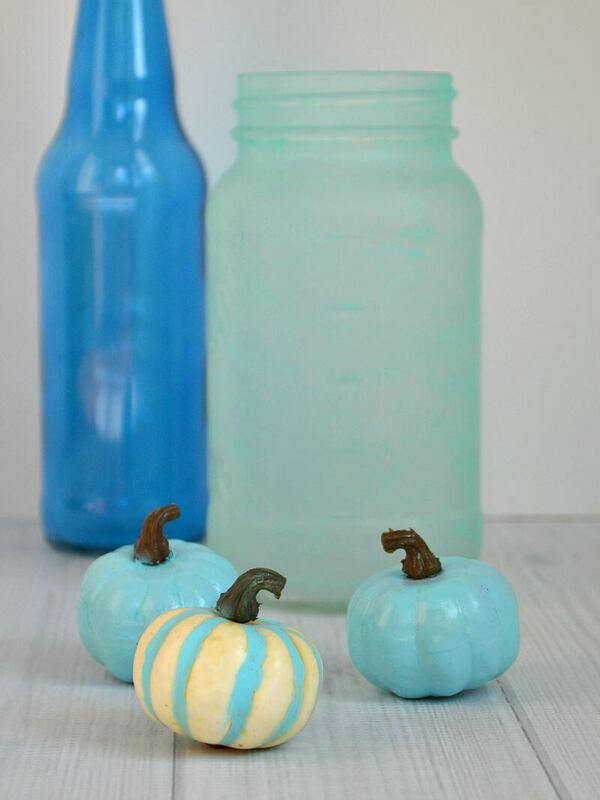 I’m happy with how easy this DIY blue pumpkin project was and thrilled with how it just makes my kitchen fall decor. I absolutely lo-ove blue accents in my kitchen. I find the combination of white, grey and blue both soothing and sophisticated. I’ve set these blue vases near my cook-top where I see them every time I walk into the kitchen. I included two jars that I made when I made the Hawaiian beach glass party lanterns. This little vignette makes me very happy, but it needed a little something more for Fall decorating. 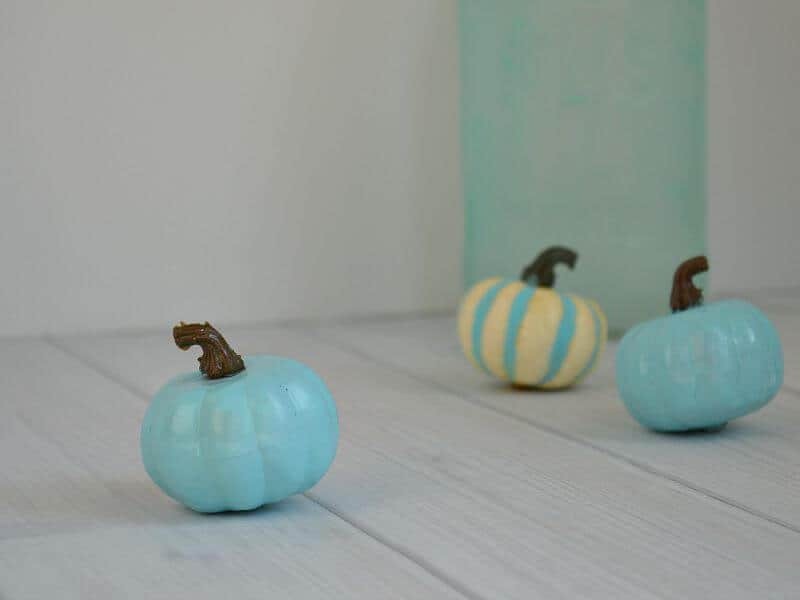 The addition of these mini blue pumpkins make even more happy when I walk into my kitchen and see them. A quick trip to the craft store, with coupon in hand, let me to this package of mini pumpkins. They were the exact size I wanted and the colors didn’t matter since I knew I’d be painting them. I used left-over blue spray paint from another project I’ll share with you soon. 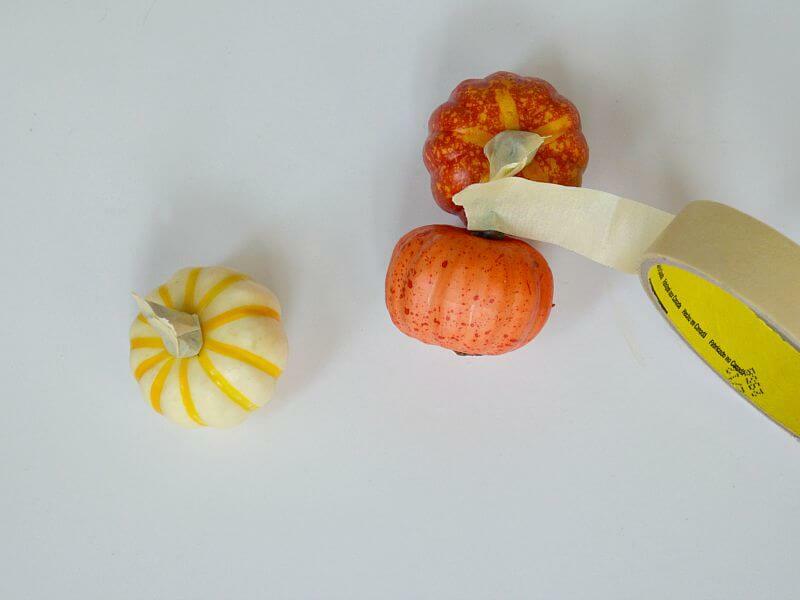 I took a minute to cover each pumpkin stem with tape. I had originally thought I’d cover these yellow stripes on the white pumpkin with blue Sharpie. Guess what I forgot? Yellow + blue = green. Opps. My next solution was to use a cotton swab and craft paint (that I already had, luckily) to paint over those yellow stripes. I’m ecstatic with the way these mini pumpkins turned out. 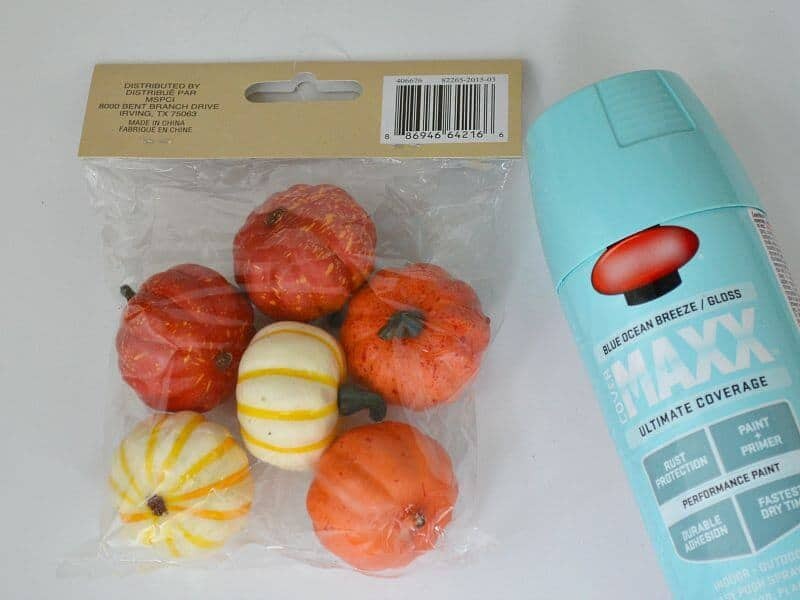 One tip – these pumpkins are very light so you can’t spray paint them unless you anchor them down. Ummm, I don’t recommend holding the stem with one hand…unless you want that hand to end up blue also (ask me how I know). 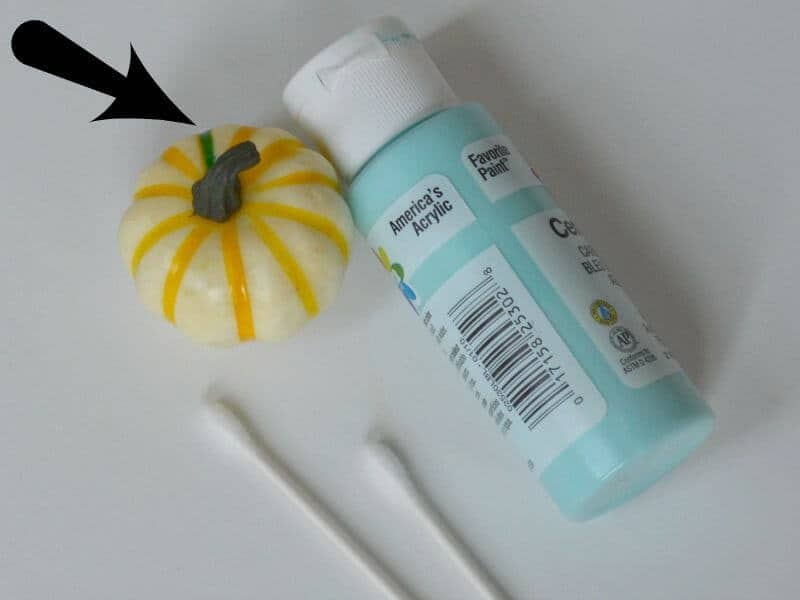 I found holding the stem with the center of a paper towel provides a shield for your hand and allows you to hold the pumpkin steady while you spray paint. 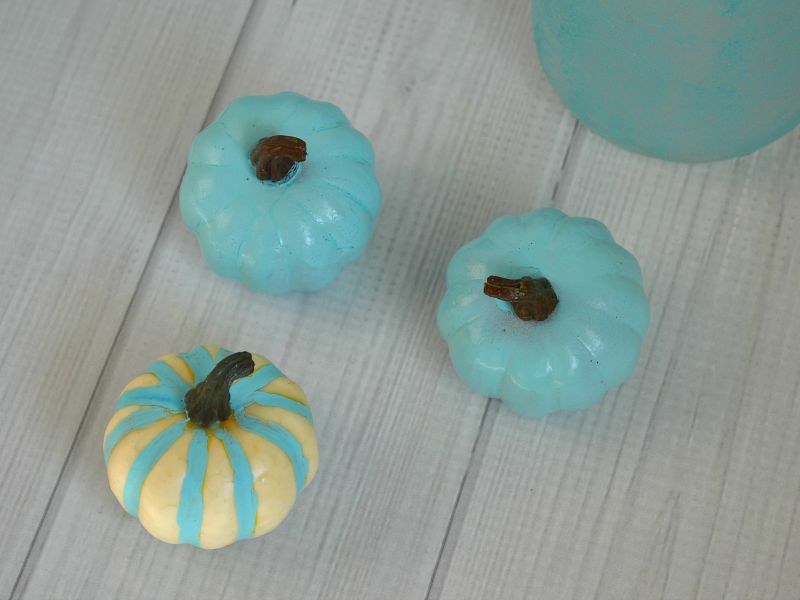 These happy little blue pumpkins will keep me happy all Fall and are versatile enough to move through Halloween and Thanksgiving, too. Do you love the color blue as much as I do? (hey, that rhymes!) 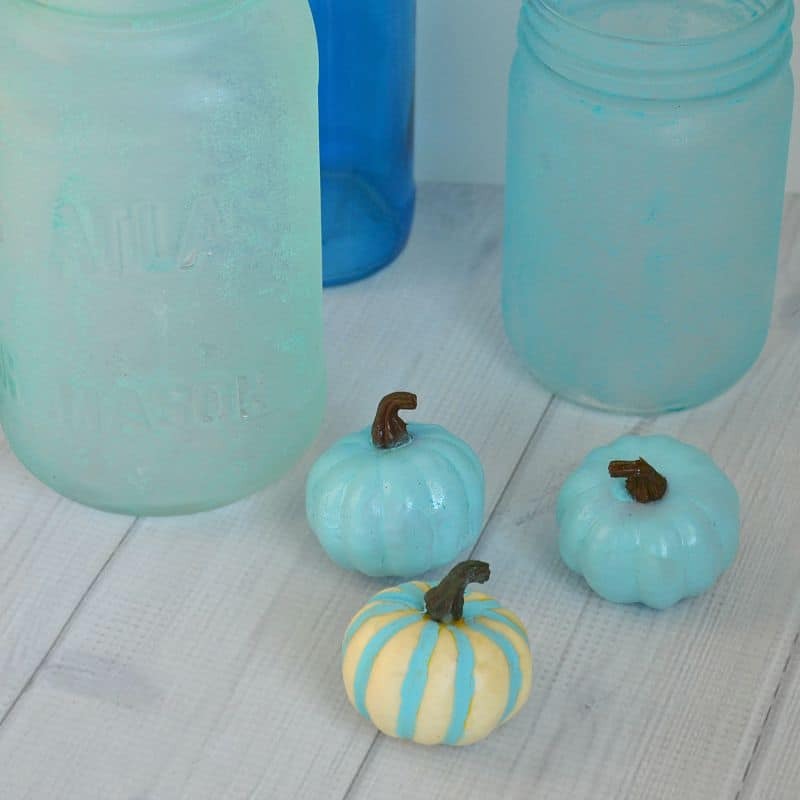 Take an hour or so (most of that is drying time, not active crafting time) to make your own DIY Blue Pumpkins for your Fall decor. My friend, Cynthia at Feeding Big, has shared a scrumptious recipe for pumpkin spice cookies that is perfect for Fall snacking and parties. I can’t wait to whip a batch up this weekend. 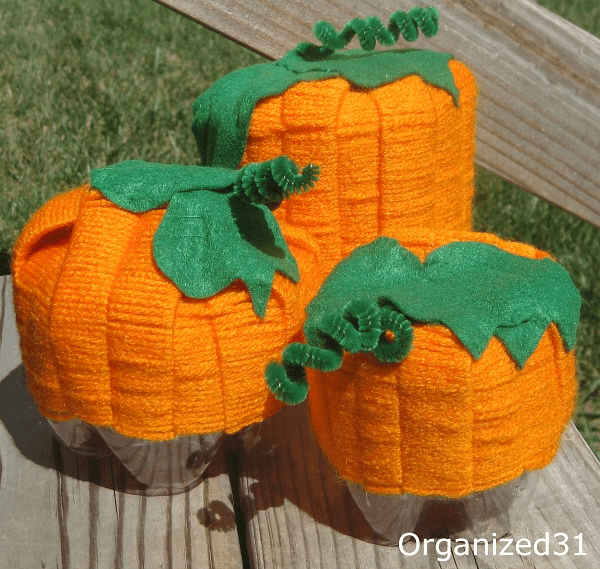 I made these soda bottle pumpkins from recycled 2-Liter soda bottles. This is a DIY project you could do with kiddos 7 and older. My family has a treasured tradition of decorating pumpkins for Halloween. A couple of years ago, my oldest daughter decorated one pumpkin for two holidays (which I think is brilliant!). How cute! Simple, different and easy – I like it! Thanks, Kelly. This is the first time I’m working to coordinate fall decorations to my new kitchen color. What great colors! Very pretty! Thanks, Lindsay. That blue is my favorite color. 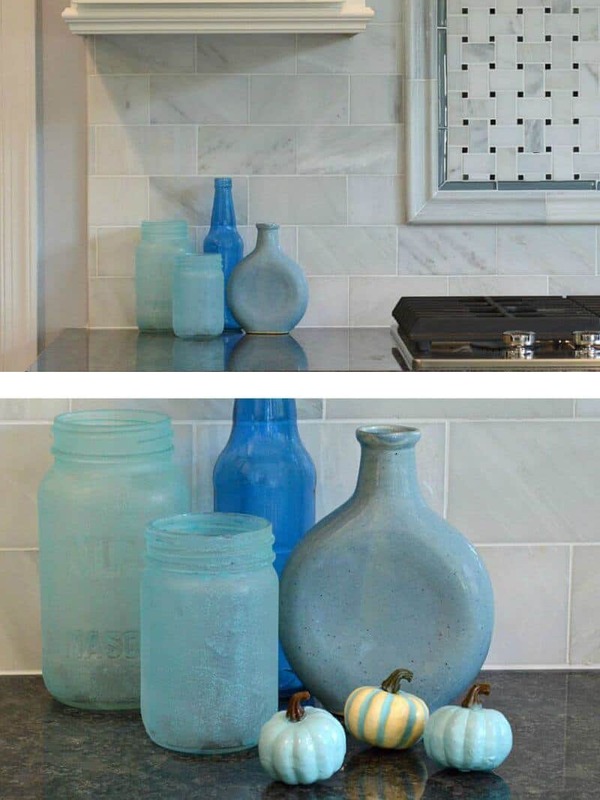 What a great way to add the pop of blue you wanted! and I love the little pumpkins with those great bottles on your kitchen counter. Gorgeous! Thanks, so much, Jill. Those little blue pumpkins still make me smile every time I walk into the kitchen (even now over a month later).